A good few months ago James and Tonya won our ‘0 to 30 in 10 months’ competition. 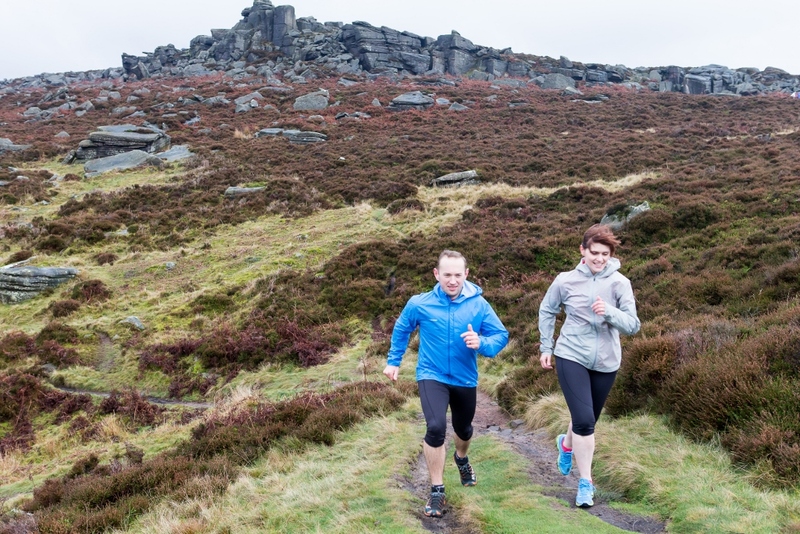 The aim was to train an ultra novice (and in Tonya’s case a running novice) to complete the Dig Deep Peak District ‘Intro Ultra’ a 30 mile trail race with 1388 metres of ascent (that’s more than the height of Ben Nevis!!!) in August 2015. James and Tonya’s aims were very different. James already had a good level of running fitness while Tonya really was starting from scratch. Dave Taylor (Fellrunning Guide) and Ian Loombe (race director for Dig Deep) got together and begun to piece together the year ahead. Never wanting to work too far ahead Dave Taylor set about writing a programme based on getting both of them to their 1st race in 2015. The Resolution Run, organised by 8.2 (www.eightpointtwo.co.uk ), at Rother Valley offers 2 distance trail races (6km and 12km) and was an ideal first target. Both James and Tonya were bang on target with James wanting to hold his own in the 12k race and Tonya wanting to run (and not walk) the majority of the 6k race. Knowing that every time I’m out training I’m a step closer to my goal and achieving more than I thought I could. When it’s so windy you feel like you can’t breathe! That has to be now, being ill and having a dodgy ankle. It’s so frustrating as I want to be training but can’t, it feels like such a setback. At least it’s happened both together so hopefully I’ll get it over and done with in one go. Completing the 6km Resolution Run, with only a couple of walk breaks along the way. The furthest I’ve run so far, ever! Does it help having a training plan? Yes, definitely! I’m completely out of my comfort zone when it comes to running so I need guidance to make sure I’m doing the right amount of training at the right time. I’d be lost without a plan. Does it help having a goal? Yes! Having a goal keeps me motivated, it gives me something to aim for and keeps me dedicated. Do you feel on track to complete the race? To complete it yes, but I feel like I have a lot of work to do to complete it comfortably and be happy with it. That’s why it’s great to have Dave & Ian helping with the training and tips. I have enjoyed having structure to my running, which is something that I have never had before. In the past I have always run when I felt like it, rather than with a plan. So the instruction on what to do and where are great! Seeing a gradual improvement in my running is also exciting. Lots more training to come and I am sure its going to get harder! Dave has also so far given sensible amounts of training that I can fit in around family and work life! When I miss a session or if I don’t perform as well as I had hoped or was supposed to during the session. Having my Suunto has helped me so I can be sure I am on track without having to grab my phone out of my bag. Balancing training with taking my dog out is a challenge – he always wants to come running with me, but some sessions just don’t work with him as he prefers to chase rabbits than run with me for the ‘fast’ sections of the training for example. Have had a couple of niggling injuries that have slowed me down a bit or stopped me training when I wanted to. Struggling to get my nutrition in order, which is frustrating me! Old habits are hard to change and selling cakes/sweet treats doesn’t help matters! lol. Longing for the lighter mornings as finding it impossible to get out early in the dark before work – lost my head torch as well so saving for a new one! No early morning or night runs for a while! Seeing and feeling the improvements in my endurance since starting the training plan and finishing 6th in the Resolution Run with what I thought was a good time for me! Definitely 100% – I have thought a couple of times what would of happened if I had entered without winning the competition. Not sure I would of even really started training yet so extremely pleased to have Dave and Ian as my coaching team! I am learning all of the time and just want to get a nutrition plan built alongside my training, then I will be really on track for where I want to be! It helps with motivation having goals to work towards with obviously the main race being the ultimate goal, but also other targets and races in the build up to the main race day, including races and nav training/recee days etc. Much more so that we met up for the photo shoot in Hathersage late last year! It was a little overwhelming then, but now I feel that I have a plan for building up to the race and that the support you guys are giving me will get me there! I want to compete in the race and my target is to finish in a good position as well as making sure I complete the full course!